Occasionally, I write articles for magazines like Consulting Specifying Engineer or Heating, Piping, and Air Conditioning. This page will provide access to those articles so you can download them if you find the topic to be of interest. Note that I am still adding content on an as needed basis, so you may want to check back every once-in-a-while to see if new articles have been added. These are articles Jay Santos wrote (and a few that I wrote) about control system design and how to develop logic diagrams and control sequences. 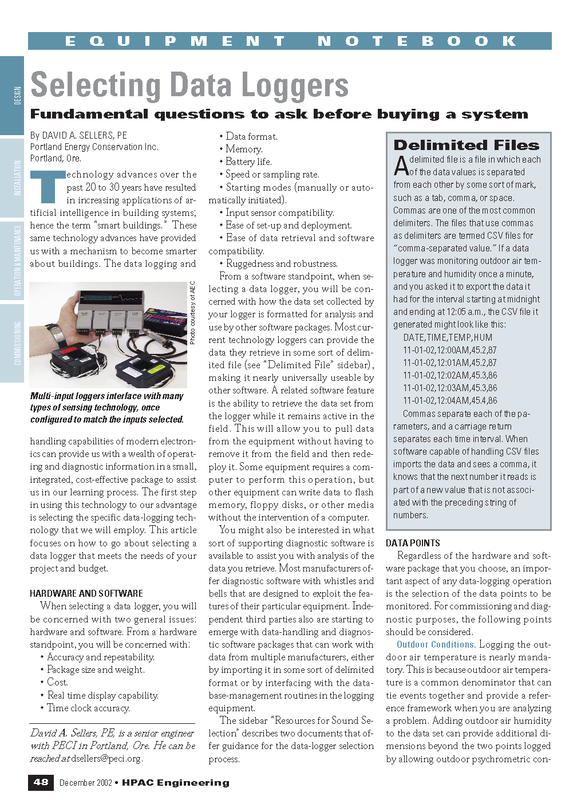 This is a series of articles I wrote for Heating, Piping, and Air Conditioning about how to use data loggers. I still apply the same principles today when I am deploying loggers, even though the articles were written back in 2002. Stuff based on physical principles can be pretty timeless I guess. These are articles that you may find helpful in terms of providing guidance for developing control logic and control system designs. The first file is a set of articles that ran in Heating, Piping, and Air Conditioning in a column called Control Freaks that Jay Santos wrote. Jay is one of the founding principals at FDE. They cover some important principles with regard to control system design, including logic diagrams. The second file is an article Jay wrote for Consulting/Specifying Engineer that specifically outlines his approach to developing control logic. It is a great framework to guide your thinking as you develop logic diagrams. The third file is a sort of 'touchy-feely" version of Jay's article that I wrote where I discuss some of the things I consider as I develop control sequences and logic. 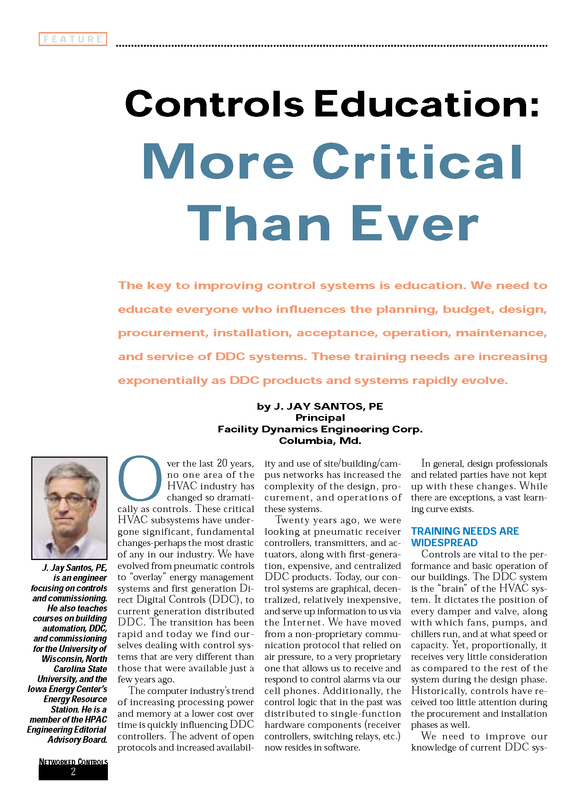 The fourth file is an article Jay wrote about the need for Master Planning for DDC systems and the general need for education about control systems due to the rapid evolution of technology . Sadly, one of the very cool resources he mentions (DDC Online) is no longer available. But the concepts he discussions still apply, probably because Newtonian physics still apply to our systems. Thus the article is still very good advice. ​This was an article I wrote for Consulting Specifying Engineer that looked at some commissioning issues that came up with the piping in a condenser water system serving a pair of cooling towers. One of the interesting things (in a nerdy sort of way) about the piping for open systems like condenser water systems is that seemingly minor differences in piping configuration can make a huge difference in how water is distributed. For instance, a non-symmetrical piping configuration in the branch lines serving the cold basins on two cooling towers that are piped in parallel that caused pressure drop difference of 0.15 psig or so in one line relative to the other could result in the basin with the higher pressure drop path overflowing while the basin with the lower pressure drop path had its make-up valve open. That is because 0.15 psig translates to 4 inches water column and the difference between the level that will cause water to run out the overflow and the level that has the make up valve open is in that range for many towers. 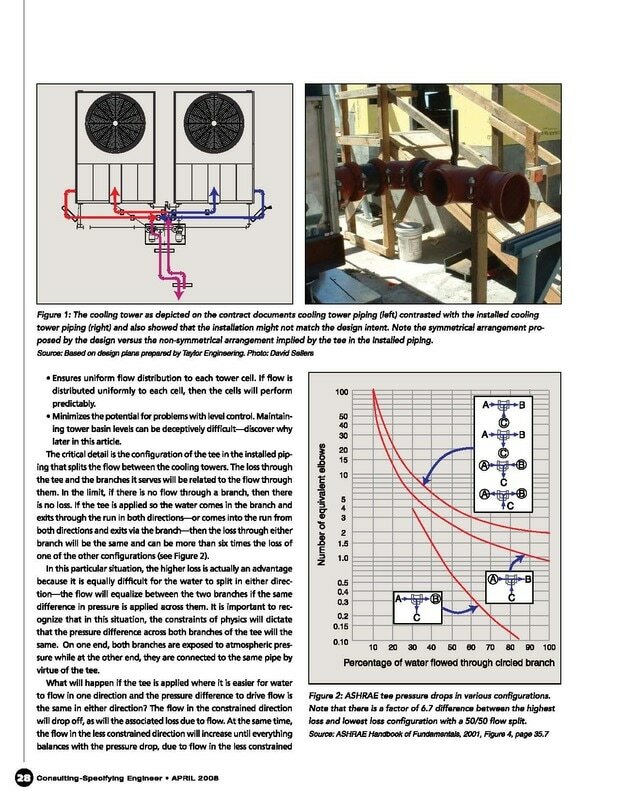 This article looks at a number of issues of this type that came up in the field on a new construction project and is the article I referenced in my blog post titled Condenser Water Systems, Air Entrainment, and Pump Cavitation. One of the first magazine articles I wrote ended up being the first in a series of articles on Data Logging that I did for Heating, Piping, and Air Conditioning. While the articles were written a while ago and there are several generations of data loggers between what you will see in the articles and what you will find on a the website of a vendor like Onset, the concepts in the articles still apply. So, if you are new to data logging, you may find the articles useful as a way to become familiar with data logging basics. Since the articles are hard to find on the HPAC website, I have posted them here if you want to download them.